It’s out!! So proud of this, the report on our results for the first year of using APS Therapy at the MS Therapy Centre in Bedford. Action Potential Simulation Therapy ( APS Therapy) for pain in people with MS; Report on a One Year Pilot Study. People with MS commonly suffer from both nociceptive and neuropathic pain, and the latter is often resistant to treatment, or hard to resolve due to the unwanted side-effects of most of the appropriate drugs. We carried out a one year pilot using the electrotherapy device APS Therapy to treat pain in people with MS, at the voluntary sector multi-disciplinary MS Therapy Centre, in Bedford, UK. An 8 week course of the therapy 3 times a week was offered initially, and 38 people used APS Therapy to treat 61 different pains. 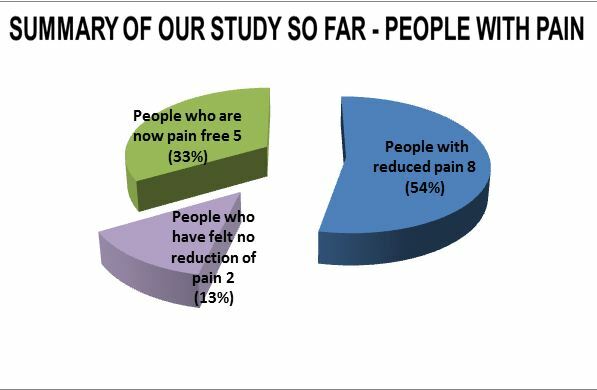 Within 8 week periods, 28 people (76%) got beneficial reduction in pain. Of the 58 pains, 50 (86%) had a reduction of at least one point on the Visual analogue Scale (VAS) for pain. 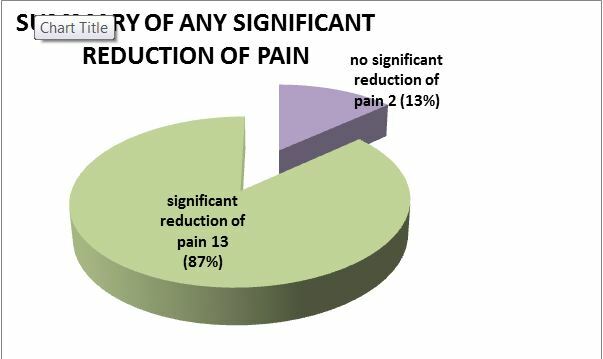 Of the pains that improved, 17 (30%) were reduced to pain free. The average reduction in points on the VAS was 4.7 points. 12 people reduced or discontinued medications as a direct result of the effects of APS Therapy; with more structured review and supervision, we feel that this number could be higher, and have adjusted our practice accordingly. Many participants reported improved sleep and enhanced energy, and the improved quality of life that this afforded. Many of the participants who benefitted, especially those with chronic neuropathic pain, felt that they needed long term treatment, but were able to maintain the benefits sustained at a reduced frequency of treatment ( once a week or even fortnightly), and elected to carry on. We were able to offer this as an ongoing service. Robust research on APS Therapy is scant, but based on the outstanding results of this pilot is a very promising area for further research and clinical treatment. The aim of treatment is to minimise the level of pain and to develop coping strategies so that the individual can carry out normal day-to-day living. Treatment options include drugs and non-drug treatments such as physiotherapy, electrotherapy or a combination. There are many studies demonstrating its’ usefulness, however, in my experience with MS it has only occasionally been effective for mild or moderate pain, but has been limited to the duration of treatment with the electrodes, or a one or two hour carryover at best. We heard about some exceptional case studies carried out in Hull using the electro-therapy Action Potential Stimulation (APS)Therapy showing effectiveness in reducing both pain and fatigue; drastically reducing the medication used, and increasing mobility, independence and quality of life in people with MS(17) and decided to investigate. APS Therapy ( Action potential simulation therapy) is a type of micro-current therapy. The APS Therapy device uses an electrical current that supposedly mimics the normal physiological action potential of nerve conduction. The device is said to produce action potentials that are four times stronger than those naturally occurring in the neuron. When swelling, inflammation, poor circulation and pain occur due to mechanical, chemical or electrical disturbances, by stimulating the body’s natural regenerative processes (as in depolarisation), it is postulated that these conditions are encouraged to resolve. (19) See discussion. People with MS who presented with pain in the MS Nurse’s clinic were screened for suitability and contra-indications, and offered the chance to trial the therapy. Pain due to spasticity/muscle spasm , or pain whose origin was uncertain, where more investigations were needed, were excluded. Contra-indications include having a Pacemaker, epilepsy, pregnancy, or cancer, or in the past 3 months, stroke, heart attack, deep vein thrombosis or pulmonary embolus. One participant had a baclofen pump; after discussion with the manufacturers of both devices, this was allowed in this case. We also checked that participants felt able to drink the recommended litre and a half of water daily during therapy. An 8 week course of APS Therapy, with 3 x sessions a week, comprising of 4, back to back 8 minute electrode placements, was offered, in a clinic room at the multi-disciplinary, voluntary sector MS Therapy Centre in Bedford, UK. We had first one, and then 2 APS Therapy clinic machines. People who could apply the electrodes themselves had one teaching session and then self-treated, with floating supervision from staff. During the 8 week course, 6 people dropped out. One had vomiting and headache after 1st treatment, decided not to proceed. Detoxification reactions ( usually headache) are possible, although not common if drinking the recommended amount of water, and are self-limiting. One experienced flickering in her vision and decided not to proceed. Although there is no documented precendent for this, and the cause was uncertain, electrotherapies can trigger migraine in susceptible people. Three people became unwell, two with existing other conditions and one with an MS relapse since starting treatment and either unable or decided not to proceed. One struggled to travel for treatment and felt discouraged after no benefit felt at 2& ½ weeks. 36 people in this study went on to use APS Therapy to treat 58 different pains. 25 of the pains were neuropathic, including 2 sciatic type pains, and 34 were nociceptive, including headaches, fibromyalgia type tender spots, backache, joint pain and arthritic type pain. 32 were women and 4 were men. The average age was 52 for women and 51 for men. 11 people had relapsing remitting MS, 22 had primary or secondary progressive, and 3 did not have MS.
We measured pain using the visual analogue pain scale (VAS), asking each participant to score for the average, or constant level of pain, and the worst level of pain, and how much of the time the pain was average, how much of the time worse. Medication use was recorded. 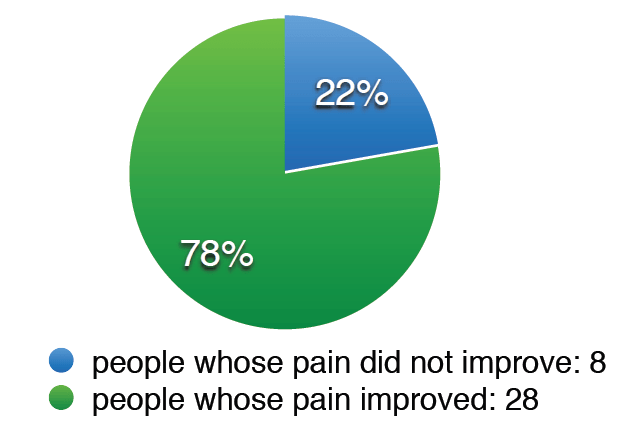 Of the 36 people, 28 (78%) had reduction in pain. Of the 58 pains, 50 (86%) had reduction. Of the pains that improved, 17 pains (30%) went down to 0/10, or pain free. Reduction’ was quantified as 1 or more whole points on the VAS for pain. Neuropathic pains appeared to respond almost as well as nociceptive pains to the treatment12 people reduced or discontinued medication as a direct result of the results of the APS Therapy, on reflection, with more supervision, we feel that this could have been more.The mean pre-treatment score on the VAS for ‘Average level of pain’ overall was 5.56. Mean reduction in pain was 4.7 points, to a mean post-treatment VAS of 2.3.Average reduction for ‘worst pain’ scores was 4.1 points on the VAS scale. nb. in the charts below, a score of 0 or pain free, has been represented by a score of 0.01, in order to show up as a colour. ‘Average pain’ in the 14 cases of neuropathic feet and legs had a mean pre-treatment score of 6.3, which reduced by 3.8 points on the VAS on average to 2.5. 2 individual’s pain did not respond at all, 12 people experienced a benefit, and of these, 5 people went to pain free. 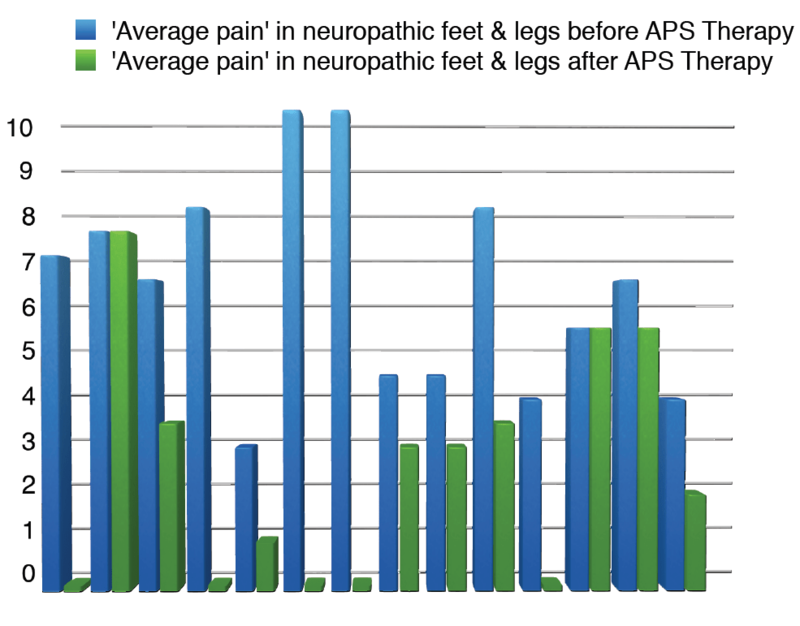 ‘Worst pain’ for neuropathic feet and legs was a pre treatment mean of 8.03, and reduced by 5.17 on the VAS on average, to a post treatment mean of 2.46, with 5 people at pain-free. 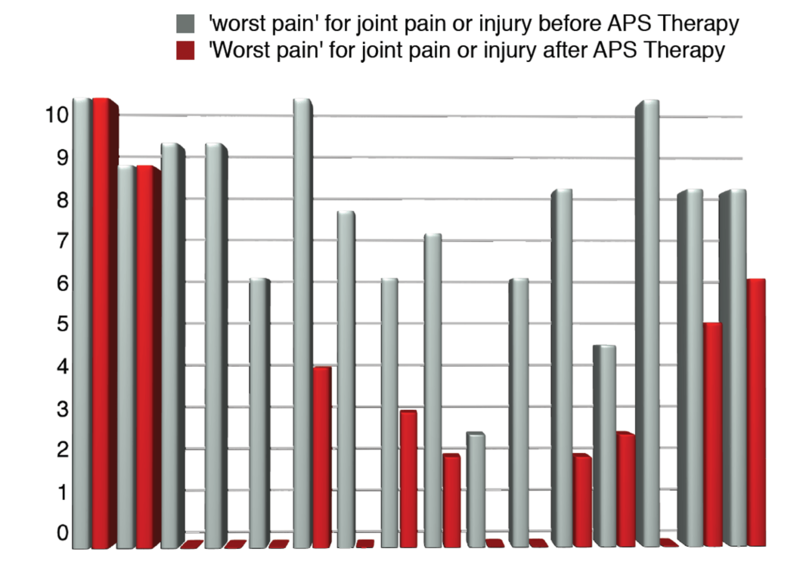 Combined ‘average’ and ‘worst’ pain scores gave a mean reduction of 4.5 points on the VAS. 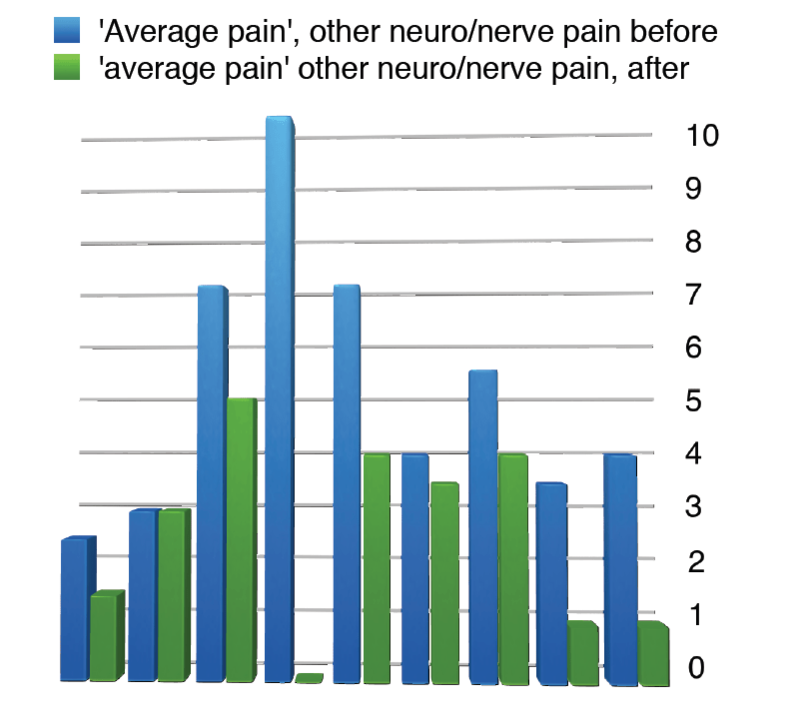 In neuropathic pain of the trunk, arms, hands and face, reduction in ‘average pain’ was a mean of less, at 2.5, but still had a reduction in ‘worst pain’ of 4.9 points on the VAS. ‘Average pain’ scores for joint pain or injury had a pre treatment mean of 5.1 and fell 2.9 points on the VAS to a mean of 2.2 . Actual results were quite polarised, with 4 people having no response, and 7 going to pain free. 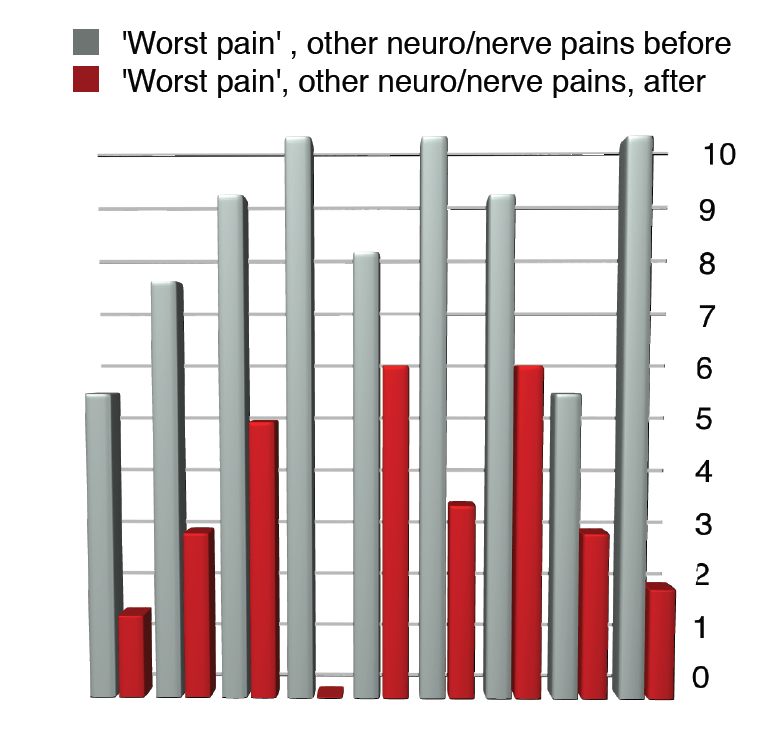 ‘Worst pain’ for the 16 joint type pains had a pre treatment mean of 7.5 points on the VAS, and fell by an average 4.9 points on the VAS to a mean of 2.6. 2 people’s worst pain did not respond, and 7 pains went to pain free. 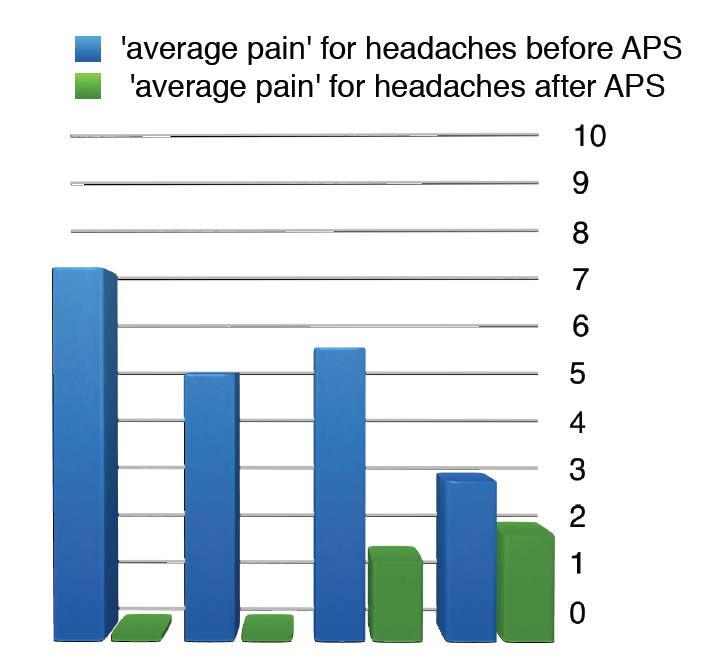 People with headaches responded particularly well to APS Therapy; the reduction in ‘average pain’ as scored by the VAS was 4.7, but our data does not catch the reduced incidence in those still experiencing headaches. ‘Average pain’ for back pain had a response of 3.3 points reduction on the VAS on average; 2 people’s pain got worse, one was unchanged, 7 benefitted, and of these, 2 went to pain free. The remaining pains were 2 cases of muscle fatigue type pain and one pain from metalwork post pin and plate, which did not respond, and 1 psoriasis pain and 1 varicose vein pain, both of which did benefit. 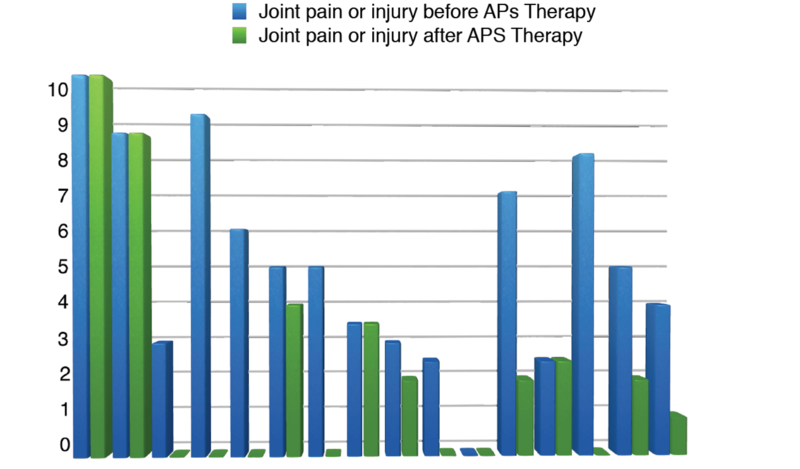 For this report, we have not managed to keep accurate data about other benefits reported during APS Therapy treatment. These have been: 4 cases of significant improvement in energy/reduction in MS fatigue, 2 cases of significant reduction swollen legs and ankles, 1 report of improvement in skin discolouration due to poor circulation, reduction in size of ‘fatty lump’ on hip, swollen gland in neck, and fluid under the skin on the scalp, 2 cases of alleviation of life-long insomnia, and many reports of improvement in sleep quality. 2 people reported no further urinary tract infections, which had been recurrent, and which they attributed to the APS Therapy, and 1; reduction in dizziness and improvement in cognitive function, which again they attributed to the therapy, and reported as a post-treatment effect. We have identified reliable and valid outcome measures that we will be using for future clinical governance to measure sleep quality and energy levels, and the effect of pain on everyday life and mood. One of our concerns when starting this project was that people might benefit, but need long term therapy, which we would not be able to offer long term. We hoped to be able to use the NHS one-off personal budgets to allow people to purchase their own machine if necessary, but the scheme was only available for people on continuing health funding in our area. In actual fact, we found that although we did have a group of people who needed to maintain therapy to maintain the benefit; but they were able to reduce the frequency of their treatment to once a week, or in one case once fortnightly, and still retain the effect, and a such we have been able to continue to provide a service for these people. We did not have research funding for this study, there was no control group, and many variables. Our sample, as typical in MS, often had to cancel appointments due to health problems, transport or general difficulties, but still achieved a remarkable result. It was interesting to note that effectiveness was similar between the neuropathic and nociceptive type pains when using APS Therapy. The mode of action is not fully understood, but injury or disease can cause oedema, inflammation, neuronal dysfunction, circulatory disturbance and lack of oxygen supply to the tissues or organ systems. 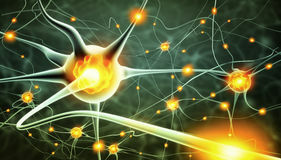 Inflammation in tissue also promotes the build-up of chemicals, known as the “inflammatory soup” which may interfere with neural transmission. If there is poor transmission or even cessation of activity along the neurone, as a result of injury, inflammation, or disease process, the system cannot conduct its action potentials, and the homeostatic and regenerative mechanisms are disturbed. It has been postulated by Papendorp (25) that introducing external action potentials through the use of APS Therapy may result in the metabolic catabolism and subsequent excretion from the body of inflammatory substances. As inflammatory metabolites may be a major cause of pain, removing the cause allows for pain reduction. Circulation is also improved and thus antibodies, enzymes, neurotransmitters and hormones are conveyed at an increased rate to the treated area, stimulating the body’s own healing mechanisms. APS Therapy seemed to be a safe and effective therapy to try in cases of both neuropathic and nociceptive pain. Participants in this study, most of whom had MS, achieved positive results using APS Therapy in 76% of cases. The therapy was safe, and in the main, people were extremely happy with mode of treatment, preferring it to drug therapy, and in some cases reducing and discontinuing analgesic drugs as a result. We hope that by presenting our pilot study of an APS Therapy service in the context of available research on the subject, we can stimulate further clinical use and research. 1) H. Merskey and N. Bogduk, Eds,.Classification of Chronic Pain, Second Edition, IASP Task Force on Taxonomy, IASP Press, Seattle, 1994. 10) Ehde DM, et al.The scope and nature of pain in persons with multiple sclerosis. Multiple Sclerosis 2006;12(5):pp 629-638. 11) Hirsh AT, et al. Prevalence and impact of pain in multiple sclerosis: physical and psychologic contributors. Archives of Physical Medicine and Rehabilitation 2009;90(4):pp 646-651. 12) Archibald CJ, et al.Pain prevalence, severity and impact in a clinic sample of multiple sclerosis patients. Pain 1994;58(1):89-93. 15) Watson, T. Narrative Review : Key concepts with electrophysical agents Physical Therapy Reviews 2010. 15(4): 351-359. 18) Berger P. Electrical pain modulation for the chronic pain patient. South African Journal of Anaesthesiologyand Analgesia. 1999;5:14-19. 19) Van Papendorp DH, Kruger MC, Maritz C, Dippenaar NG. 20) Watson, T. Narrative Review : Key concepts with electrophysical agents Physical Therapy Reviews 2010. 15(4): 351-359. 21) Papendorp DH van. (2002). Assessment of Pain Relief on 285 patients with chronic pain. Biomedical Research 2002; 26: 249-253. 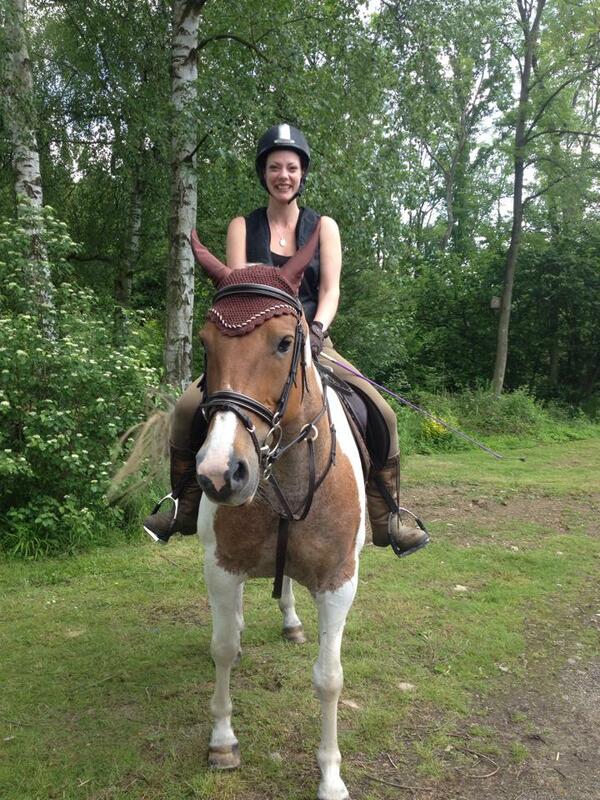 25) ) Papendorp DH van. (2002). Assessment of Pain Relief on 285 patients with chronic pain. Biomedical Research 2002; 26: 249-253. Article published as of now. Thanks to the guys from the MS Therapy Centre in Bedford who’ve been game to share their stories. We’ve had lots of new stories generated even since this too! np80FINAL (1) Here’s the PDF to the full article. Going to try to get just my bit, as this file is huge. 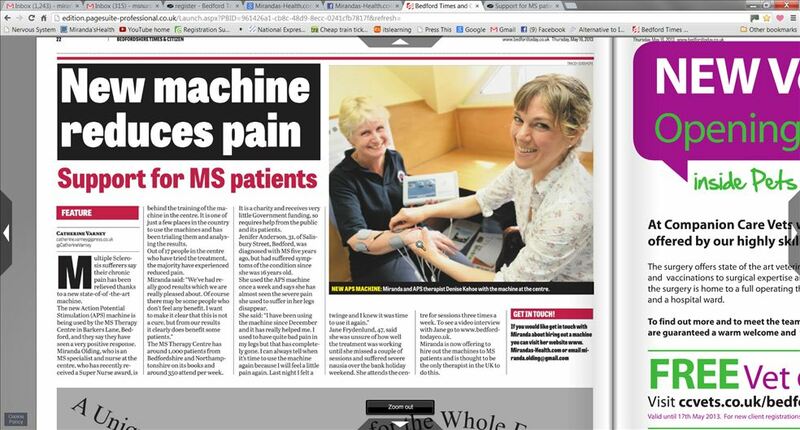 Recently we had a local newspaper article that started off so well, about the exciting results we’ve been getting with APS Therapy at the MS Therapy Centre in Bedford. Then in the last paragraph, it said that I was now offering to rent APS machines to MS patients, which made it sound as though I was renting them to my own patients, and was an unintentional mistake by the journalist. To be clear, people with MS who live in Bedfordshire or Northamptonshire can come to the MS Therapy Centre and have this therapy for free, and I will be involved, as the MS Nurse there. In my private business, I do a variety of therapies, not aimed at people with MS, and I tend to keep the 2 separate. I have added renting APS Therapy machines to my business, and this is available for anyone from the general public who has pain. I am advertising this in local papers and on my business facebook page. 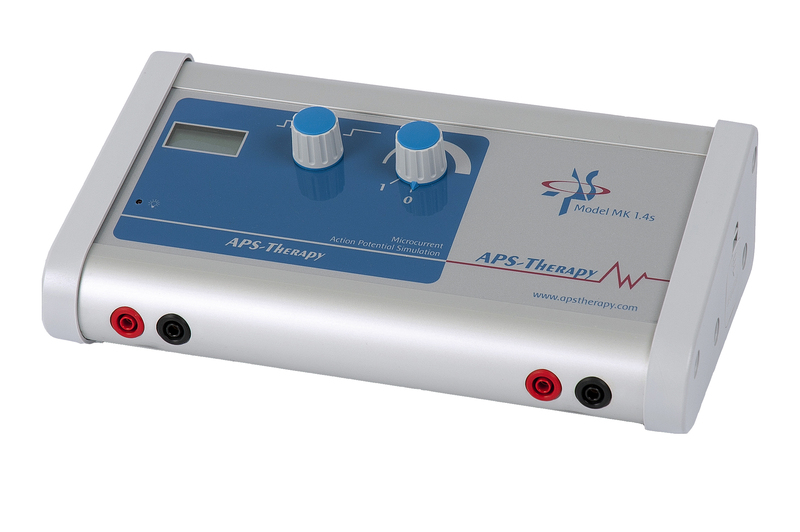 At the moment, I am the only UK supplier of APS Therapy machines. However, if & when people with MS want to purchase a machine, I supply them direct from the manufacturer, without taking commission, as long as they can prove that they have MS. People who are not members of the Beds & Northants MS Therapy Centre will still need to pay for their training, treatment plan and follow up time. This is important to know, as in June/July there will be a peice in the MS magazine New Pathways about what we are doing at the MS Therapy Centre, and also about my business. Here’s a round-up of our results so far. Neuropathic pain in limb: 7/10 down to pain free; complete pain relief which lasts 4-5 days, but appears to need long term treatment as comes back after this time. Neuropathic pain in the feet and feeling ‘like walking on hot sand’, constant, 6-7/10 down to 3-4/10 in 3 weeks, hot sand feeling down to ‘not very often’ and improvement in blue-ish discolouration due to poor circulation..
Hip pain 6/10 constantly, complete relief since the first week, has not returned, and a decrease in neuropathic pain in the leg from 4/10 to 2/10 in 3 weeks. Back pain, 8-9/10, worse on exercise, down to pain-free, 2-3/10 on exercise. Treated x 2 weekly for 6 weeks. Has not returned, 1 month after end of treatment. Leg pain, ‘pounding, throbbing’, 8/10, down to pain-free, has started to creep back since recent sensory relapse. Long term shoulder pain, 2-7/10 to ‘much better’ but has since had to stop treatment for personal reasons. Hip pain 10/10 plus, no benefit. This could be because there’s a serious problem that needs attending to underlying the pain, or because high doses of opiate painkillers make the treatment less effective. We’ll be helping this person get the right investigations and treatment, and maybe try again later. Headaches, constant, 7/10 down to pain-free, and back pain 7/10, down to 1/10, plus complete relief from insomnia. Chronic pelvic pain, 2-4/10 normally, 7-8/10 when bad, happening less frequently, tramadol usage has dropped from daily to 2-3 x a week, now reducing Amitryptilline also. Hip pain, 8&1/2 /10, very severe, ‘sickening’, no change, although improvements in sleep pattern. We are helping this person get investigations carried out. Hip pain, 7/10, 8/10 when worst, down to 4/10 after 3 treatments, but also had deep physio manipulation prior to starting! Headaches, 4-6/10, 9/10 when worst, 2-3 x a week, for most of life, worse since starting Rebif, down to pain-free; has had one headache since starting therapy, when had not drunk enough water. Has not taken regular painkillers for weeks. Back pain, 4-6/10, 7-8/10 when bad, down to 3/10. Stopped Naproxen and Co-codamol use. Knee pain (which was unreported, as forgot about it) has disappeared. Much more energy, staying up past bedtime, cleaning. ‘Squeezing’ altered sensation feeling, 7/10, 9/10 when worst, no change yet after 4 sessions; muscular pain in shoulder blade area, 4/10, 8/10 when worst, down to 2/10 after 4 sessions. 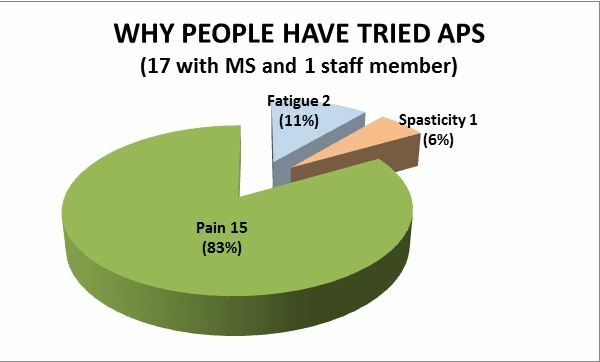 So in summary, in our study so far, 18 people have used the APS Therapy at the Centre, 17 with MS and one member of staff. 2 tried APS for fatigue, and 1 for spasticity, and disappointingly, these conditions have not experienced a significant benefit to date. 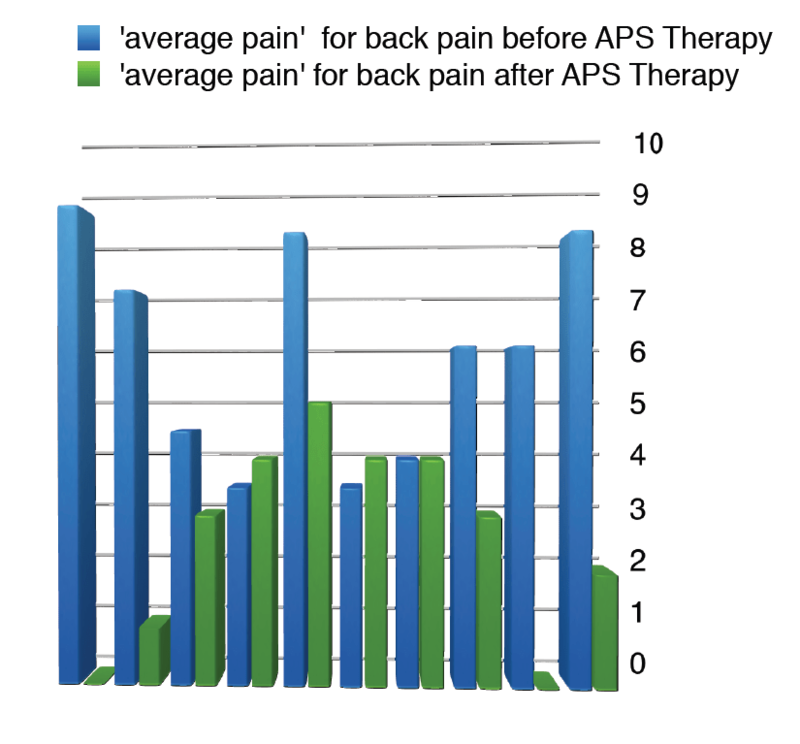 15 people used APS Therapy for pain. Of these, 13 have felt a significant reduction in pain, and 2 have not. 2 also report a significant increase in energy. Of the people with pain, 5 have achieved pain-free. Of these, 2 people’s pain has not come back since completing the course, one needs to maintain therapy once a week, and 2 are still completing their course of treatment. c) Have none of the following: heart attack, deep vein thrombosis, stroke or pulmonary embolus in the past 3 months, cancer, epilepsy, or pregnancy. I will refer you on to Denise, to start a 6 week treatment plan. 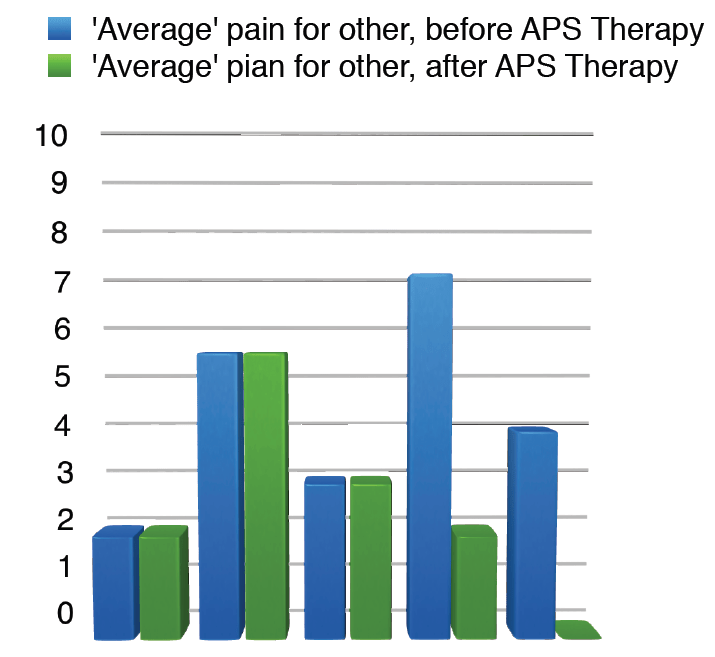 For some pain, APS Therapy may be able to completely and permanently resolve the problem. For some people it may not help at all, and for others, it may significantly reduce or resolve the pain, but need to be continued to keep getting the effect. In those cases we can help you to purchase your own machine direct from the manufacturers if you wish, and also to apply for charitable funding if money is a problem. It’s very exciting to be working with such a new, drug-free treatment. We intend to start helping people to review their medication once they get a good result, with a view to reducing pain medication. 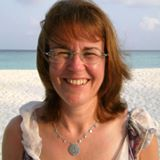 This blog has grown from my work as an MS Specialist Nurse, 3 days a week at the MS Therapy Centre, Bedford, UK. I love my job, especially as I’m allowed the freedom to continuously explore ways you can optimise your health and life when you have MS, from both a ‘conventional’ and a more natural perspective. 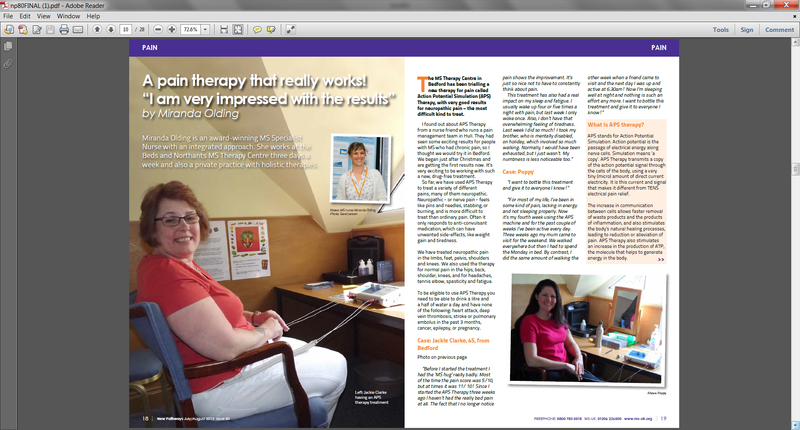 Specifically, the blog is an expansion of my regular feature in our MS Therapy Centre newsletter. I’m going to upload all my old ‘posts’ so you can see what I’ve been thinking/learning about over the last few years; the new stuff will go in both places. Doing a teaching session on MS & the bowel on a Peristeen course; I’ll try to upload it here. Also I am still rounding up the feedback from those people who tried the natural detox product; more on that later! Recently met up with a friend, a nurse,who is now the leader of a fantastic pain management team in Hull. She told me about the very very good results – people coming off medications completely – that a doctor working in a hospice in Hull had been getting with people with MS who had severe neuropathic pain, and severe muscle spasm, using APS machines. Their team had organised for someone from the Dutch company who manufacture and supply the machines and training, to come and do a training day in Hull – which I managed to attend. Basically this therapy looks a bit like TENS, but it’s a different type of electrical current. You put sticky pads on your skin, which are connected to the machine via wires, and then a direct current of micro-amps is directed to travel through the cells of your body, from one pad to the other. The current simulates – ie is just like, Action Potential – which is the name for the way that electrical signals pass along a nerve. This apparently stimulates the release of more ATP, which is needed to create energy in the body, and also speeds up the detoxification from cells, and the result, after a period of treatment, is said to be reduced pain and increased energy. So obviously I am excited!! whether we can add to the body of knowledge being gathered about it. So this is happening on July 27th – can’t wait!